Since the rapid commercialization of drones, the public’s desire to reach the skies has only grown. Companies, in response, have designed and released new drones- big drones, small drones. Each with improved features and advanced technology year after year. It has come to a point where just about anyone with some money to spare and a thirst for flying can get their own drone to play around with. However, the regular drone with its sprawling size and shape just doesn’t cut it anymore. No one wants to lug around a huge drone container outside. In a lot of instances, a cumbersome drone is not practical to take anywhere far away. This is how the small drone came to exist. 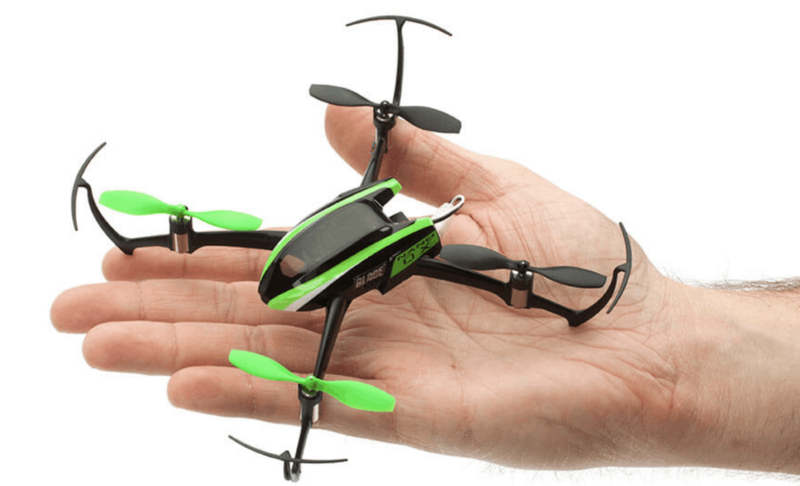 The small drone was designed to be compact, just small enough to fit on the palm of your hand. They are much lighter than medium to large drones. The small drone is rapidly gaining popularity since they are easier to carry and often come with the latest features. They are not to be confused with the nano drone. The latter is smaller than the small drone, and are only a few inches in length. Unlike the nano drone, the small drone is not restricted strictly for indoor use. As long as weather conditions are favourable enough, small drones are sturdy for outdoor flight. This perfect balance of small enough to carry with ease but hardy enough to handle the great outdoors is mostly the reason why people prefer the small drone more and more these days. With the drone market currently being so competitive, new models are being released consistently. It makes it difficult for the average, non-tech savvy folks to find the small drone that they need. Well, do not you fret. We have got you covered. This guide will give you an insight to the world of small drones and the models that people love and rely on the most. So strap in, folks. This is going to be a bumpy ride. Before you start scouring the market for the small drone of your dreams, take note of this. First, you must consider what you want your drone to do. People falsely assume that all drones have built-in cameras. Truthfully, there are three basic types of drones: camera drone, toy drone, and racing drone. The last one, the racing drone, is a highly specialized type for competitive racing. And, as such, we will not dwell too much on it. The camera drone is most likely the type you have seen around the most. Obviously, this type has a camera pre-installed on the drone. These cameras can often take high resolution photos and videos which can come in handy for a multitude of reasons. Depending on the model, camera drones can be incredibly advanced. They are built with super intelligent features and a much longer flight time. As a result, this type can be a bit pricier than the toy drone. 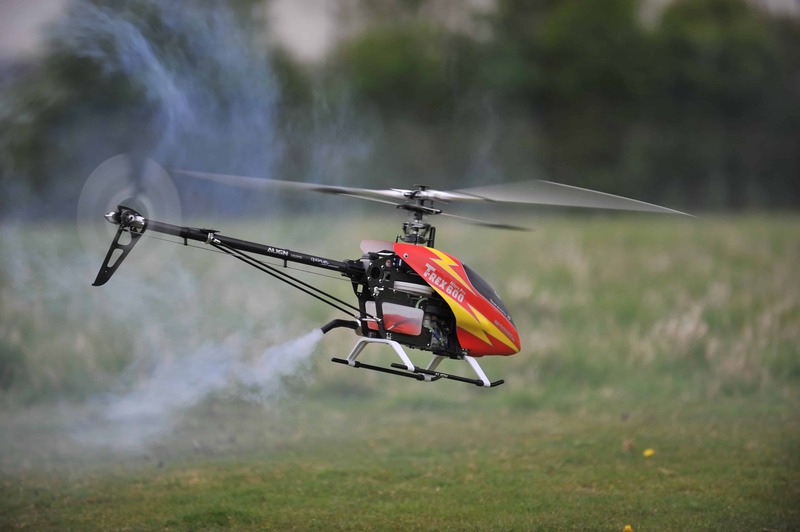 But if you are looking to just play around with a remote controlled aircraft, the toy type might be best suited for you. It is comparatively easier to fly than the camera drone and much more affordable. Beginners would love the toy drone. You can use it as practice before you start flying more complex (and expensive) drones. It should be noted that toy drones can be outfitted with cameras but they are mostly either standard or low quality cameras and, because toy cars don’t offer an integrated gimbal (to support the camera), the images can come out blurry. If you want to take aerial shots with your drone, best to invest in a proper camera drone instead of risking it with a toy drone. Before you buy your own small drone, make sure to decide what type you want first. Are you planning on taking aerial shots or just flying around the garden for fun? Once you make up your mind about what you value the most from your small drone, then you are ready for the next step. 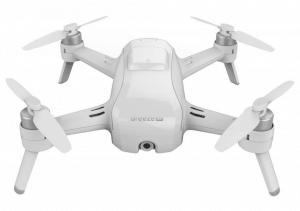 Starting this list with a bang, we have the Ryze Tello Quadcopter Mini Drone from DJI. This small drone has a camera built-in ready to take photo or videos from up in the air. As small and lightweight as this aircraft is, it is jam packed with high end features. These will not only make flying easier for beginners, but also incredibly fun to explore with friends and family. The Ryze Tello is already ahead of the competition with more than ten minutes of flight time per charge. Its five megapixel camera can record 720p videos and takes JPEG photos. You can control the Ryze Tello either with your smartphone (with the Tello app) or with your VR headset. And because this drone was made with DJI Flight Tech, you are guaranteed to have a steady, safe flight. And if you are a computer whiz, you are going to adore the Ryze Tello’s system. The designers of Tello made Scratch, the MIT-developed coding system, programmable so you can explore and learn about the software while also getting a fun little drone to play with. 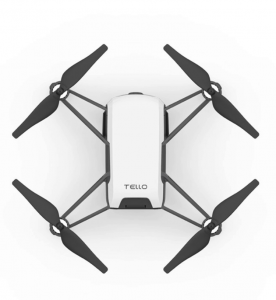 However, all great things come with a price and the Ryze Tello is no as budget-friendly as some other small drones. But with such an incredible piece of tech (inside and out), the Ryze Tello is obviously worth the price. 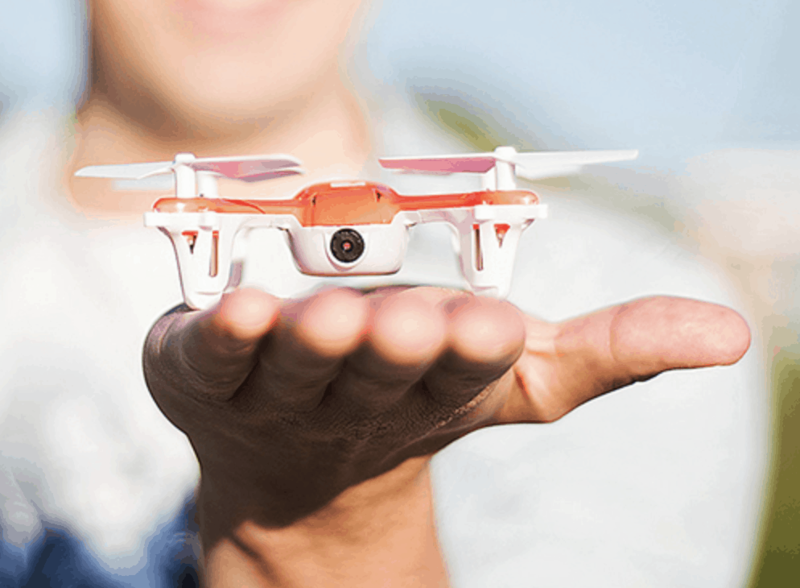 For beginners on a reasonable budget, this small drone will be perfect for you. The SYMA X5C-1 Quadcopter is designed specifically to be an ideal starter drone with its easy controls, simple features, and stability. 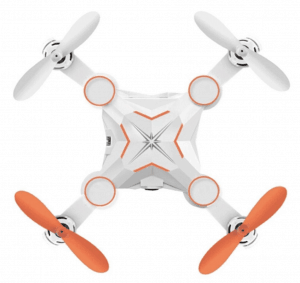 The X5C-1 comes with a 6-axis Gyro stabilization system, a 720p HD camera, and a 360 degree Eversion feature. It is wind resistant and can be flown outdoors no problem. You can get around eight minutes of flight per charge with this drone. If that is not enough, this small drone also includes spare blades (the most breakable drone part) and extra batteries. The X5C-1 is a drone you can get your money’s worth. The SYMA X5C-1 is definitely a great starter drone that will get you to fall in love with flying immediately! Known in certain circles as the “Selfie Drone,” the Yuneec Breeze is another drone that is perfect for beginners with little to no piloting experience. The Yuneec Breeze has a built-in high quality camera. But it does not have the full Gimbal support of more professional drones with similar camera quality. You can get ultra HD 4k aerial video clips as well as 13 megapixel photos with the Yuneec Breeze, hence, its unofficial title. This small drone is mainly for casual use, for people who want to take high quality photos or videos with their drone. This super lightweight drone can be flown indoors and outdoors. You can take it anywhere because it doesn’t take up too much space and weighs less than a pound. The Yuneec Breeze comes with an auto-landing feature that makes it, well, a breeze to fly. It also comes with propeller guards that are super useful and safe for indoor use. Did we mention that the Yuneec Breeze has five automated flight modes that are custom designed? This feature will aid you with whatever activity you might require from your drone. If you need to take a selfie but do not have much experience with flying, turn on Selfie mode. 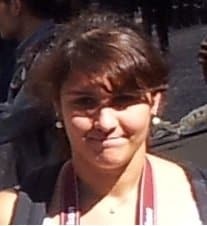 And then, you can take a stunning photo of yourself and your friends with just a few simple commands. The Follow Me mode directs your drone to react to your movements and track you. You can command your drone to hover over an object with Orbit mode. Or, you can get your drone to position itself at a certain angle with Journey mode. And if you want to have control over where and how your drone flies, you can always use Pilot mode. Though the Yuneec Breeze is not an economic drone, it is worth the couple extra dollars with its top quality gear and features. Now here i a beginner-friendly drone for those looking for a little more speed. 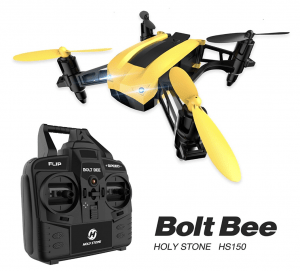 The Holy Stone HS150 Bolt Bee Mini Quadcopter is a great entry level racing drone that can introduce you to the world of drone racing without having to spend too much. This sleek small drone is designed to go fast. It can reach up to 50km/h and has five speed modes. The motors are extremely high powered so you can whiz past your friends with this agile drone. The Bolt Bee has impeccable 3D Rolling capability so you can do tricks and flips as much as you want while its 6 axis gyro stability makes flying safe and steady. However, the Bolt Bee has a standard flight time of five to seven minutes per charge. So, you will need to bring a few extra batteries if you want to spend more time in the sky. Even if you are not too interested in drone racing, the Bolt Bee is still an excellent choice as a beginner drone. Veteran pilots, too, can enjoy this small drone. Satisfy your need for speed with the Bolt Bee Mini Quadcopter! It is easy to pilot and low cost. You will not regret it! This charming little aircraft might look simple enough but it is loaded with high quality features of a large drone. Yet, it has the lightweight and portable advantages of a small drone. The Rabing Mini RC Drone is great for novices and experts alike with its impressive flight capability and FPV transmission. The Rabing is armed with a mini HD 0.3 megapixel camera so you can take photos and videos as you fly. 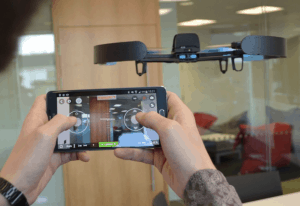 Controlling this small drone is easy too because it’s compatible with IOS and Android operating system. You can even plug in your VR gear and get a real first person view of the world from above. What is truly remarkable about the Rabing is its flight time and battery life. This drone has an average flight time of seven to ten minutes, quite the feat considering it is such a small drone. What’s more is that it only takes half an hour for the battery to fully charge. Most drones take at least an hour more! Perhaps the only downside with this drone is the camera quality is not as crisp as other models. This drone is mostly a toy drone when it comes down to it. However, it is super affordable and packed with the latest features so the Rabing is definitely a drone to consider. This one is from the hi-tech and innovative company that pioneered the first ever fully foldable drone. GDU 02 is without a doubt a game changer in the world of small drones. The GDU 02 is extremely lightweight and portable, with the remote control and the drone itself collapsible and attachable to each other so you can store it quite nicely. GDU has upped their game once more by introducing the GDU 02’s latest design: the sliding arms. Fully folded, the GDU 02 looks like a strange little box. But once you slide the propeller arms from the drone’s body, you can see that it is the top of the line flying vehicle that it is. Even more impressive is this small drone’s flight time – a whopping twenty minutes max in the air. Woah! It is equipped with a 4K camera and supported by a 3-axis gimbal. This advanced drone is great for photos and videos too. However, this drone does not support a micro SD card but it does have a 16GB internal memory. Flying this bad boy is as easy as can be with its Obstacle Avoidance and Vision Positioning sensors. 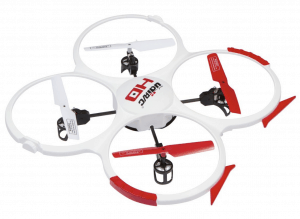 The GDU 02 can track objects below it and avoid them for a safer landing. All that said, the GDU 02 is an excellent small drone that is great for recreational and even professional use. However, it does come with a hefty price tag. Because, it has high end features and top quality tech. It stands to reason that the GDU 02 will cost you a pretty penny. Nevertheless, if you want a hi-tech drone that is easy to carry and easy to fly, you will want to invest in the GDU 02. This small drone is perfect for beginners looking for an aircraft with a high quality camera for photos and videos. 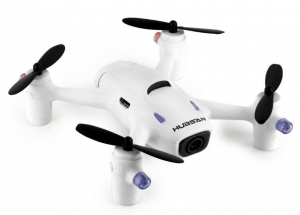 The Hubsan X4 Camera Plus H107C is yet another excellent model from Hubsan, the company that is known for their world-class quadcopters. The Hubsan X4’s built-in high definition 720p camera can take beautiful and clear images that will satisfy any photography enthusiast. This small drone is designed to be more stable too with its altitude hold technology. So, you will not have to worry about missing that perfect shot. You can fly this quadcopter indoors and outdoors. Its 6-axis gyro allows stronger wind resistance and stability. Controlling the Hubsan X4 is easier as well so newbies will not have too much trouble with this. 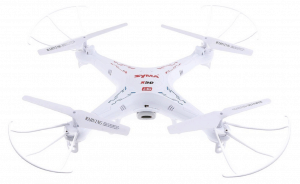 This drone is relatively affordable which makes it an excellent choice as a starter drone. Last but far from the least, we have the UDI RC 818A Quadcopter, a solid, reliable, and beloved small drone for novices and experts alike. Not only is the UDI 818A budget friendly. But it is also super safe to fly indoors. It has these large bumper guards around each propeller to avoid cutting anyone with those dangerous blades in an unfortunate collision. This quadcopter is equipped with a 2MP camera that can take high definition 720p photos and videos. The UDI also has built-in LED lights to help you navigate in dim lighting. Flight time is pretty standard with this drone. With only six to eight minutes per charge, you will need to bring extra batteries to extend your time in the air. Now that you have got a few viable options laid out before you, there is still a few things you will need to consider once you do purchase your own small drone. Although it is commonly advised to start with an inexpensive drone to get the hang of the controls, some low cost drones are actually not as easy to control as others. They may be cheaper. But sometimes it is because they lack the features that can aid newbie pilots, like sensors to help avoid obstacles. If you find an inexpensive drone on the market (that we have not listed above), check its features. Rather, check its lack of features. You might get a drone at a good price but if you cannot control it… well… you might just end up paying even more than you bargained for. Some models come with spare parts. However, because accidents happen no matter how careful you are, it will do you some good if you buy spare parts beforehand. A few extra batteries, some additional propellers (they wear out the fastest), and propeller guards can seriously help. Imagine getting the hang of flying only to be stuck on the ground. Because one of the propellers broke and the new ones you ordered will not arrive for weeks. Save yourself the pain and buy spare parts. Drones come with a user manual and, as dull and annoying as this sounds, you should read it and get to know what your drone is capable of, its limitations, and the like. At the very least, give the manual a skim to get an idea of your drone. No one likes reading instructions but no one likes crashing or losing their most likely expensive drone either. If you are just starting out, keep your flying practices simple and slow. Do not mmediately go for those insane tricks you have seen on the internet. It might be tempting to do a flip once you have got your drone off the ground. But, you need to master the basics before you can move on to more complicated flying. In some places, flying a drone is restricted. Check if there are RC aircraft regulations in the area you are planning to fly. Of course, if you have your own private property, this might not be a problem but what is the point of getting a drone if you cannot explore outside your comfort zone? Do some quick research before you fly your small drone in public areas like the beach or the park. There are even resources online that can inform you of no-fly zones. So, it is a good idea to check them out. Especially with small drones that are lighter than the average large drone, you shouldn’t risk flying when the weather’s too tempestuous. You might accidentally lose your drone in a brewing storm! Not to mention that not all drones are waterproof. Even if the wind isn’t too strong, it might start raining. Your small drone might get caught up in the drizzle and malfunction. If you truly want to fly despite the stormy weather, stay indoors. Before you start flying, like all aircraft of any size, you need to inspect your drone. We have listed the essentials that you will need to check below. The batteries of both the drone and the controller (or your smartphone) should be fully charged. Most standard drones have short flight time even with a full battery so do not take any chances with a half full battery. Examine the drone for any irregularities. Is there anything sticking out where there should not be? Are any of the screws loose? Was there anything caught in between the propellers during the last flight? Are the propellers in good condition? Be thorough in your inspection. Check if your drone and your controller of choice is fully synced up. If you are using an app with your smartphone, make sure the connection is stable. Make sure that you clear the area as best as you can. If you are outside, make sure there are not any obstacles in the immediate vicinity. Inform those around you that you are flying a drone as well to avoid any casualties. It is advisable to check how your drone flies indoors before you head on out. Let your drone hover a few feet off the ground. And then, check the controls to see if they are in working condition. Once you have confirmed everything is in perfect order, you can aim for the skies!